Mans best friend .. these cute dogs would go anywhere with their owner! Enduring a bumpy crawl up a steep logging road which features a host of deep drainage channels - these dogs where still excited about their outing. Dogs in the back of a pick-up truck on Northern Vancouver Island, British Columbia, Canada. Here is another page with great and cute pictures of dogs. 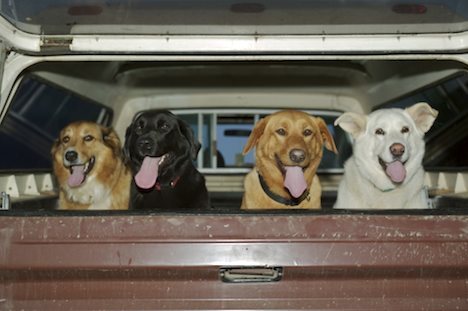 Photo of four cute dogs in the back of a pick-up truck during an evening outing on Vancouver Island.